Chad Zallow represented Youngstown State University by taking third place with a time of 7.69 seconds in the Fred Schmetz 60-meter hurdle at the Millrose Games on Feb. 9. Zallow competed against runners from all over the United States and Canada, and placed above Johnathan Cabral, a former Olympian for Canada. The winning time of 7.61 seconds was run by Devon Allen, a former member of the United States Olympic team. The Millrose Games is a historic track and field event that is held in New York City every February. The event dates back to 1908 when employees of the John Wanamaker Department Store started the Millrose Athletic Association, a recreational athletic club. From 1914 to 2011 the games used to be held at the historic Madison Square Garden. They are currently at the Fort Washington Avenue Armory, which is the former home of the 22nd Regiment of the Army Corps of Engineers. A few of the indoor track and field records at YSU are held by Zallow, including the best time for the 60-meter dash (6.72 seconds) and the 60-meter hurdles (7.61 seconds). He broke the 60-meter dash record earlier this season at YSU’s Watson and Tressel Training Site. Chad Zallow’s older brother Carl Zallow was also a member of YSU’s track and field team, who won a few events himself during his tenure with the Penguins before graduating this past spring. Both brothers had excellent careers in high school at Warren John F. Kennedy. 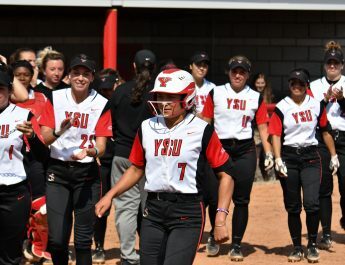 YSU’s track and field program has had great success over the past several years. Both the men’s and women’s indoor teams are defending Horizon League Champions. YSU will be hosting the Horizon League Indoor Track and Field Championships on Feb. 23 and 24 at the Watson and Tressel Training Site.